Bakuriani, Georgia (CNN) -- The 21-year-old Georgian luger who propelled to his death after sliding off the track during an Olympic practice run in Vancouver was laid to rest in his hometown Saturday. 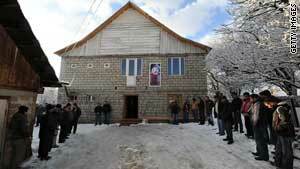 Some 4,000 citizens from every walk of life mourned silently as Nodar Kumaritashvili was buried in his hometown of Bakuriani. The mourners included President Mikhail Saakashvili, who was clad in a Georgian Olympics shirt to show his national solidarity. "I wanted to throw a wedding feast for you," the athlete's father, David Kumaritashvili, said in a eulogy. "Instead we have a funeral." Kumaritashvili died during a practice run when he slammed into a steel pole near the end of the 4,500-foot-long course and was propelled off the track, according to the International Olympics Committee. A preliminary inquiry said human error caused the accident because he came out of a turn too late. But Nodar's family and many Georgians don't accept that explanation. There had been concerns from athletes about the speed of the record-setting track at the Whistler Sliding Center in Vancouver ahead of the opening of the 2010 Winter Olympics, according to a Georgian official. "There were some questions asked by other athletes even before this tragic accident," said Nikolas Rurua, Georgia's deputy minister for culture and sports, adding that there had been several crashes in the same area. "But at this moment it would be premature for me to jump to any conclusions." Video of the crash shows Kumaritashvili lying motionless after being thrown from his sled and striking the pole when he was coming out of the course's last turn. He was given cardio-pulmonary resuscitation by medical staff on site before being transported to a hospital where doctors were unable to revive him, the IOC said. The luge is often called the "fastest sport on ice." Sliders use their legs and shoulders to steer small fiberglass sleds down an icy track, at times approaching or surpassing speeds of 90 mph, according to the Vancouver 2010 Winter Olympics Web site. They are positioned on their backs with their feet straight out in front of them and their heads back to be as aerodynamic as possible. A track speed record -- and world speed record -- was recorded at Whistler on February 21, 2009, when a single men's luge athlete, Germany's Felix Loch, topped 95 mph during competition. American luger Tony Benshoof held the previous world speed record of 86.8 mph set in 2001. A somber seven-member Georgian delegation wore black armbands to the February 12 opening ceremonies, and a black ribbon was tied atop the Georgian flag in tribute to Kumaritashvili. The team received a standing ovation from the 60,000 spectators in attendance. Kumaritashvili's death was the first time an athlete had been killed during the games since 1992, when a Swiss skier crashed into a snow-clearing machine on a public trail while training in the closing days of the games, according to NBC News, the official broadcaster of the Vancouver Games. Journalist Eka Kadagishvili contributed to this report.